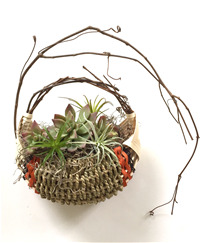 Petit free form wall basket made from grapevine, dyed rattan and seagrass. Natural, Chestnut and Black colors. 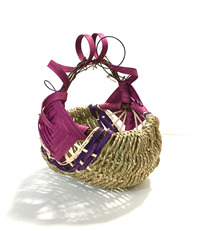 Loops of dyed rattan on a grapevine frame, woven of sea grass. Lime Green & Grape colors. 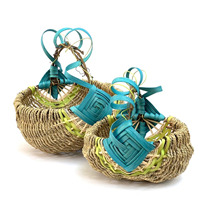 Lops of hand dyed rattan on a grapevine handle, woven of sea grass. Magenta and Lilac colors. 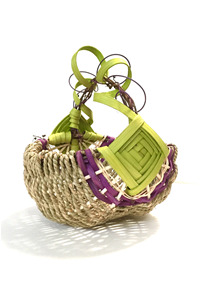 Hand dyed rattan, woven of sea grass with grapevine twigs. Magenta, Lilac and Gray colors. 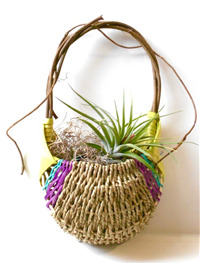 Loops of hand dyed rattan; grapevine ans sea grass. Aqua and Lime colors. 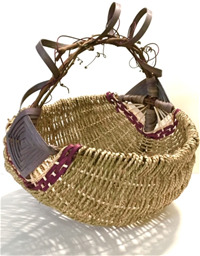 Woven of sea grass; grapevine and hand dyed rattan. Gray and Wine colors. 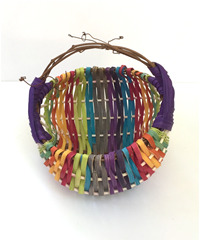 Hand dyed rattan in Rainbow colors and Grapevine. 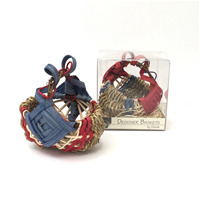 Miniature version of the Sea Grass Basket - packaged in a 3" clear box. Assorted colors. 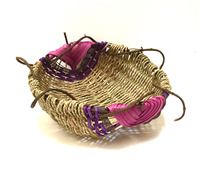 Petit wall basket woven of sea grass woth loops of grapvine and hand dyed rattan. Lime Green, Grape and Aqua colors. Miniature version of the grapevine handle basket, presented in a 4" clear box. Scarlett and Cobalt blue colors.